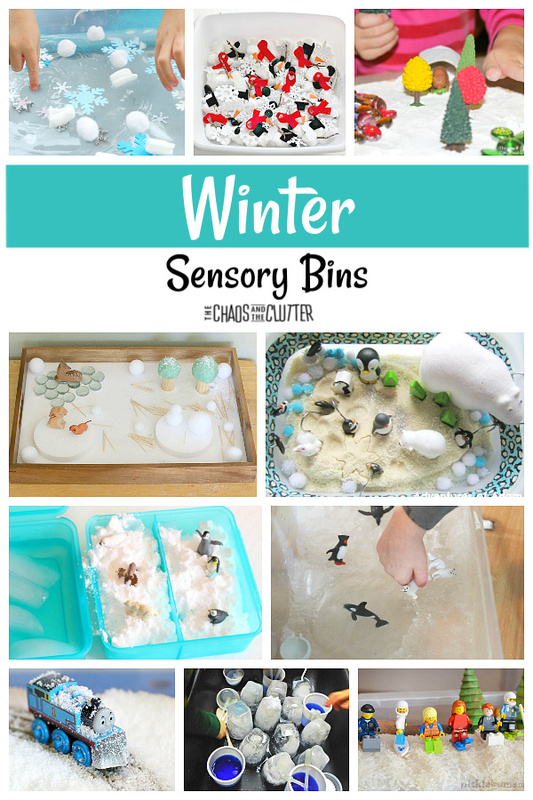 Sensory bins are so easy to make and don’t have to cost anything. 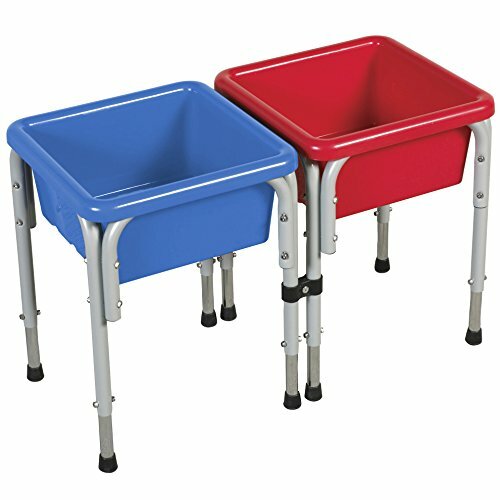 In fact, there are sensory bin fillers already in you home just waiting to be used. 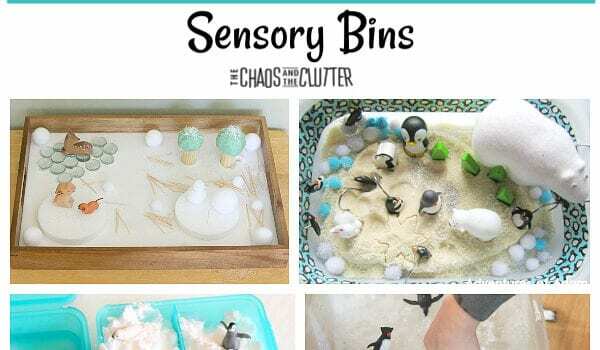 Sensory bins are kind of my go-to sensory activity. 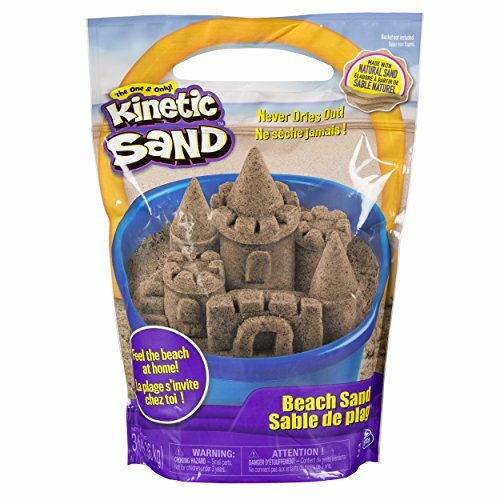 They allow kids to really explore through their senses and discover the world around them. 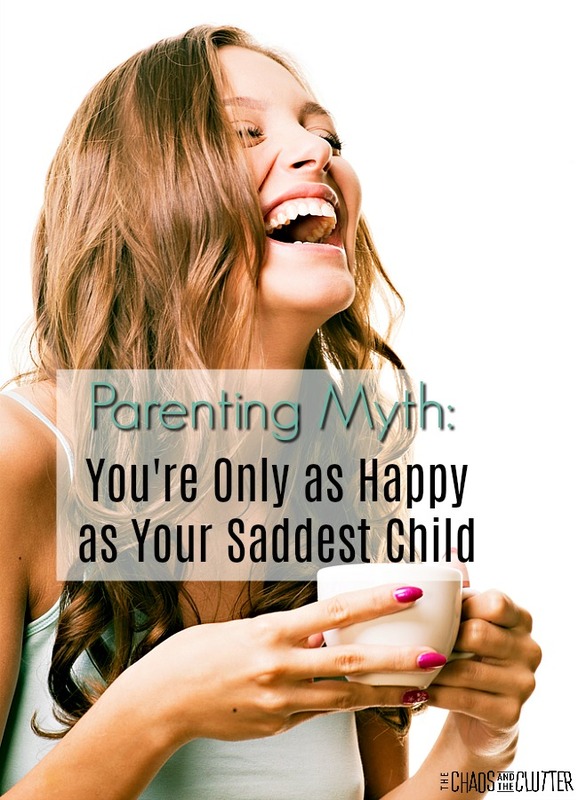 Kids from toddlers to teens can benefit from this method of exploration. 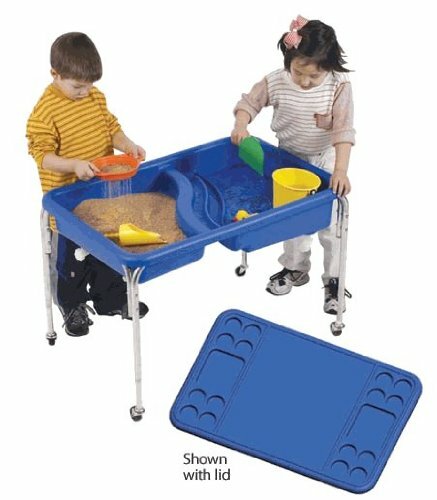 Sensory tables or bins are also great for use in the classroom. 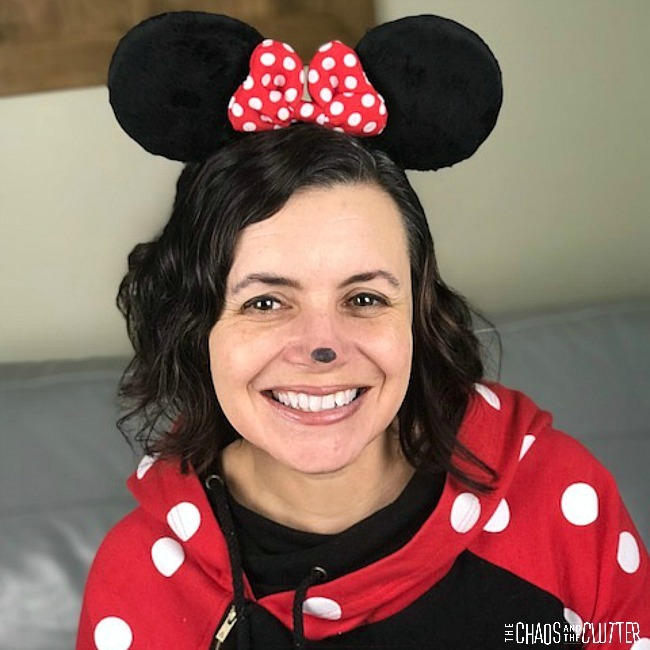 They can be centered around an educational unit or theme, can have a planned purpose such as the intention to improve fine motor skills, or they can just be for free play. Incidentally, all of these types are beneficial. 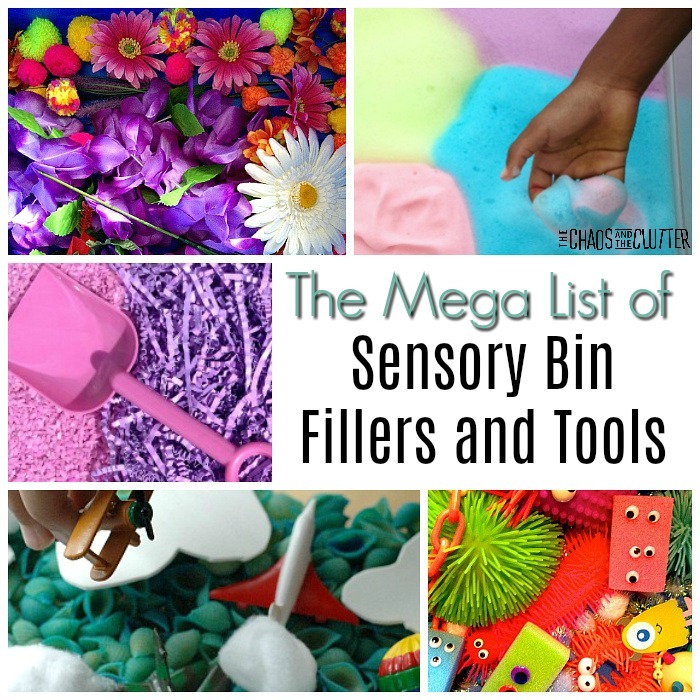 Whether you are creating sensory bins for your child to play in at home or needing sensory bin filler ideas for preschool, these lists will hopefully give you a place to start. 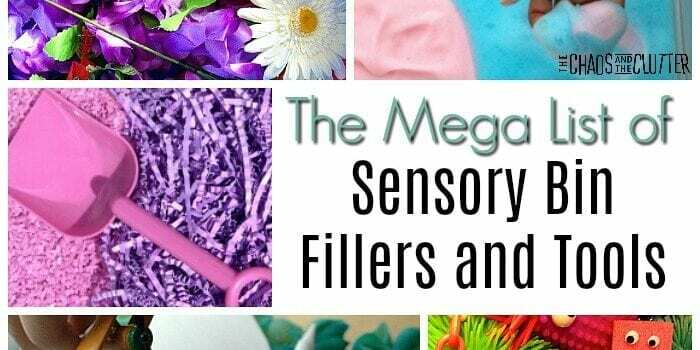 I have linked to examples of sensory bins that include the fillers below to provide some additional inspiration. 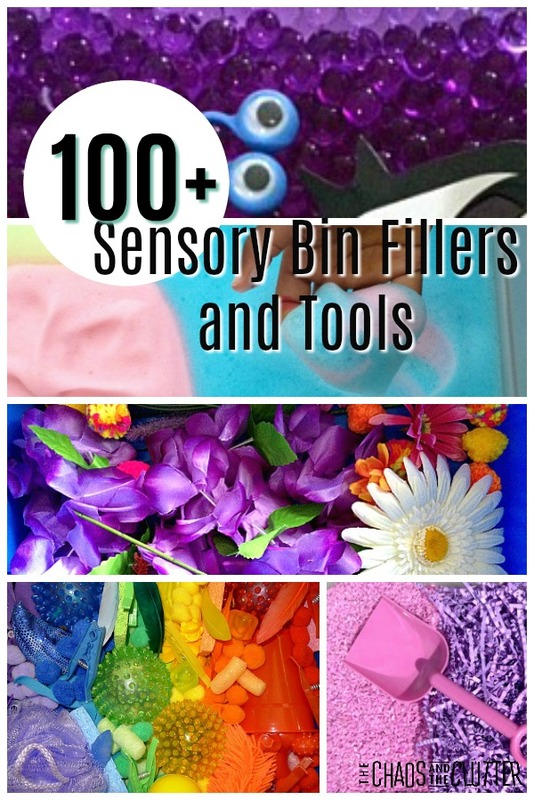 Many sensory bin fillers can be coloured. 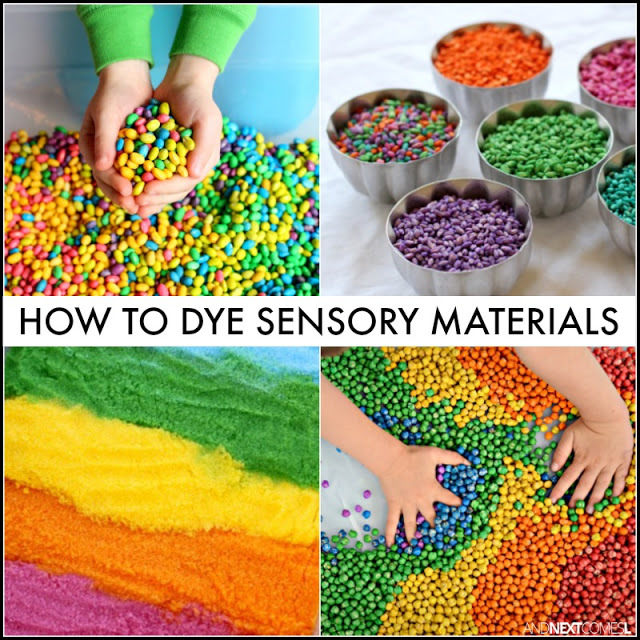 You can find detailed instructions for how to colour each of these items in this helpful guide on how to dye sensory materials. Scents can also be added to some of them by adding a few drops of essential oil. Be sure to know whether the scent you are using is one that is calming or alerting and use accordingly. 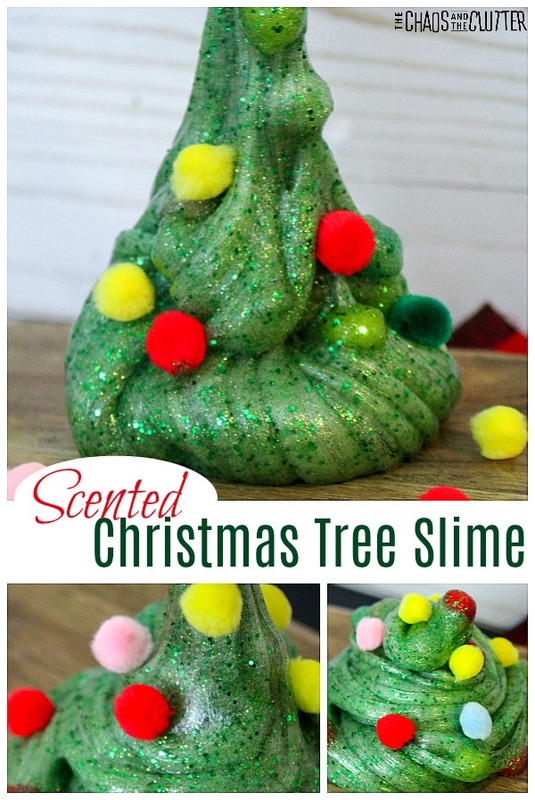 You wouldn’t want to have a child playing in a lemon scented bin just before bedtime as that is an alerting smell, but that would be a great sensory bin to use in the mornings! 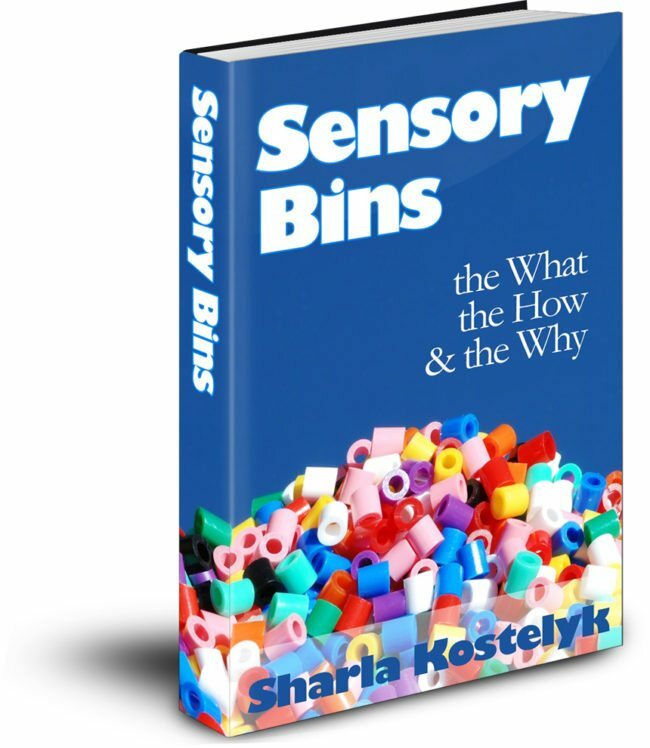 When looking for materials for sensory bins, you want to consider factors such as the age of the children who will be using it, safety, the shelf life of the items, and if the bin will be played with inside or outside. 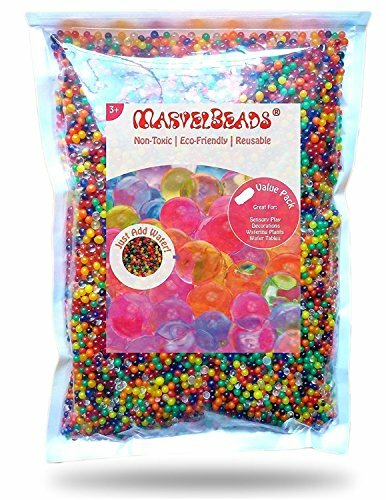 You wouldn’t want to put water in a sensory bin that was going to be used outside in below freezing temperatures because it would freeze and expand, possibly causing the plastic bin to break. You also wouldn’t want to use perishable food items in a bin that was being used in a warm temperature climate prone to bugs or you’ll get creepy crawlies in your home or classroom. 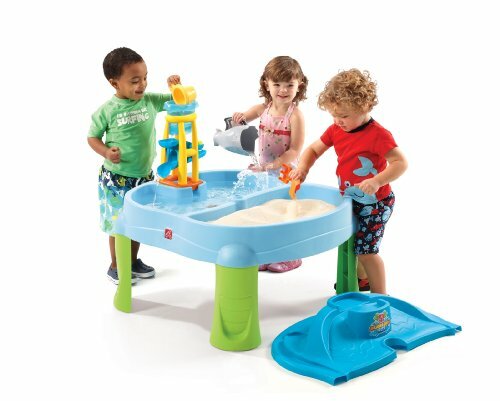 Sensory bin tools are additions to the sensory bins that are designed to further the experience for the child. 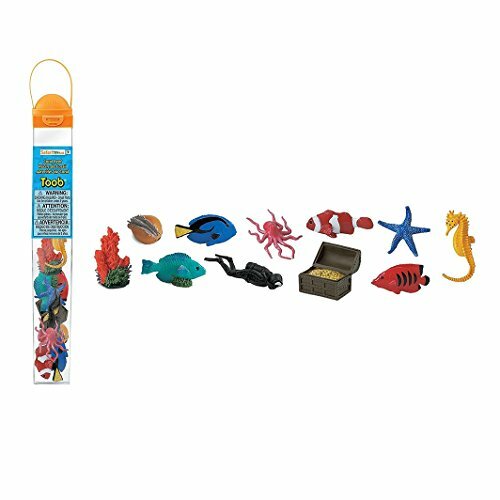 Many of these tools provide an educational element or are designed to enhance fine motor skills. 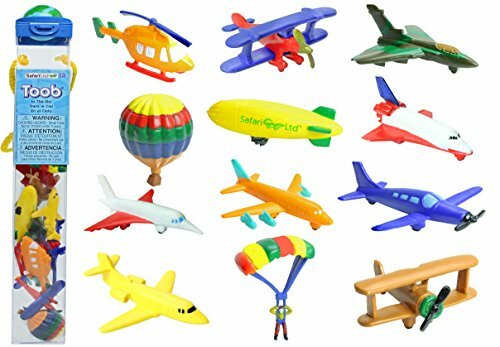 Of course, as with all sensory play, adult supervision should always be used. 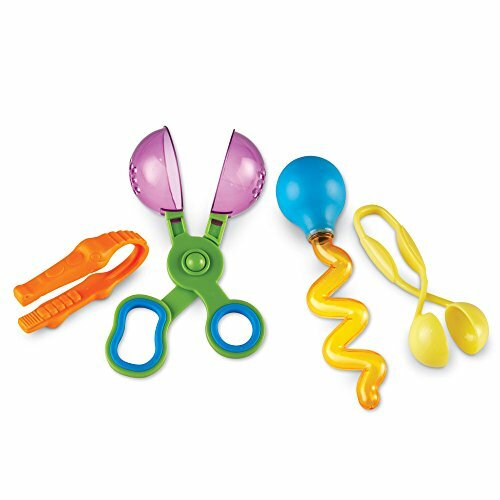 Some of these fillers and tools are more appropriate for older children. 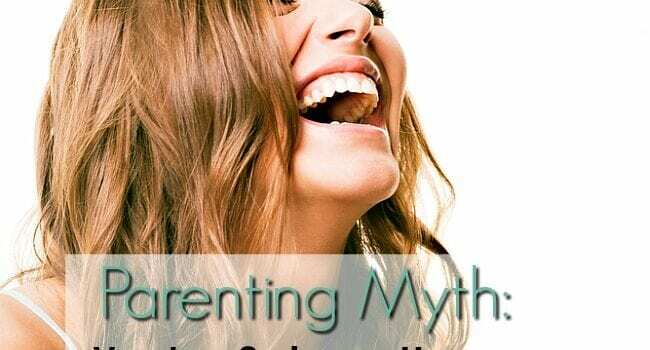 You know your child best, so if it’s a younger child who tends to put things in their mouth, be sure not to choose sensory bin fillers or tools that may pose a choking hazard. 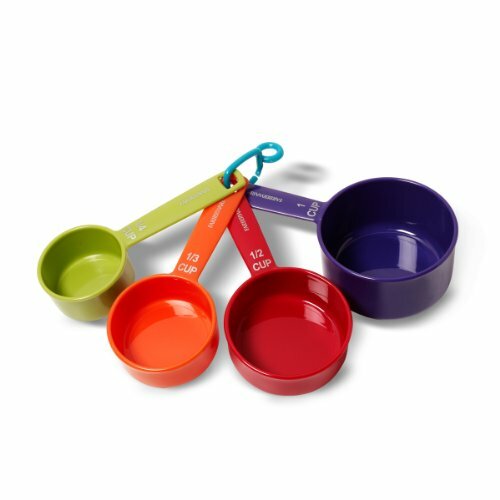 If your child is new to sensory bins, you’ll want to help them in the beginning. Model some ways to play by scooping, dumping, pouring, feeling, kneading, filling, measuring, and using your imagination. Talk about the textures and sensations you’re feeling to give them the vocabulary to speak to you about their experience. 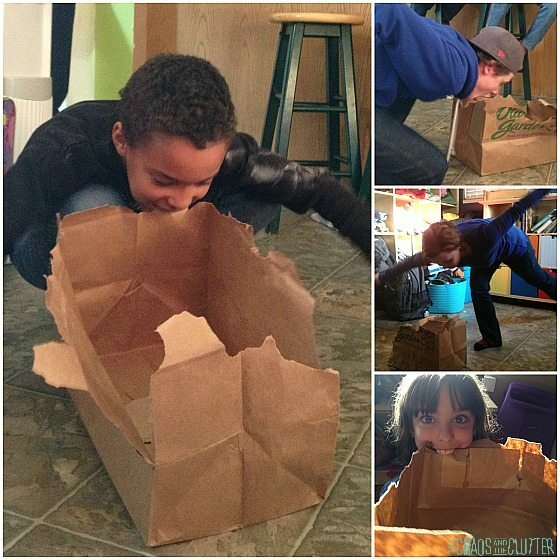 There is no one “right” way to play with sensory bins. Allow kids the freedom to explore, create, imagine, and play. 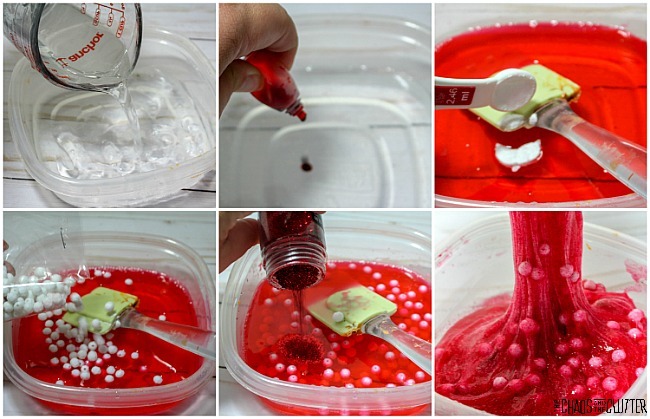 With younger kids, you’ll want to remind them to try to keep the sensory bin contents inside the container. Some kids are better at this than others. 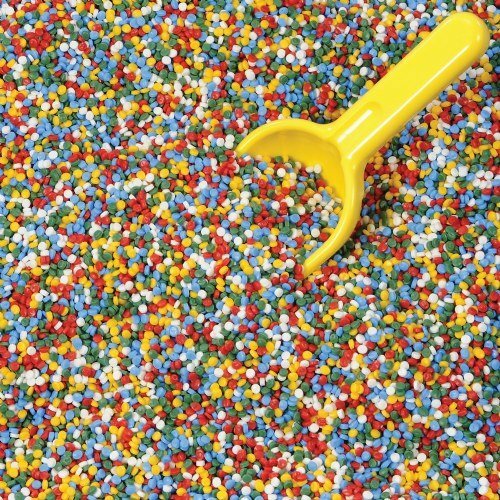 One of the common complaints that parents have about sensory bins is the cleanup. 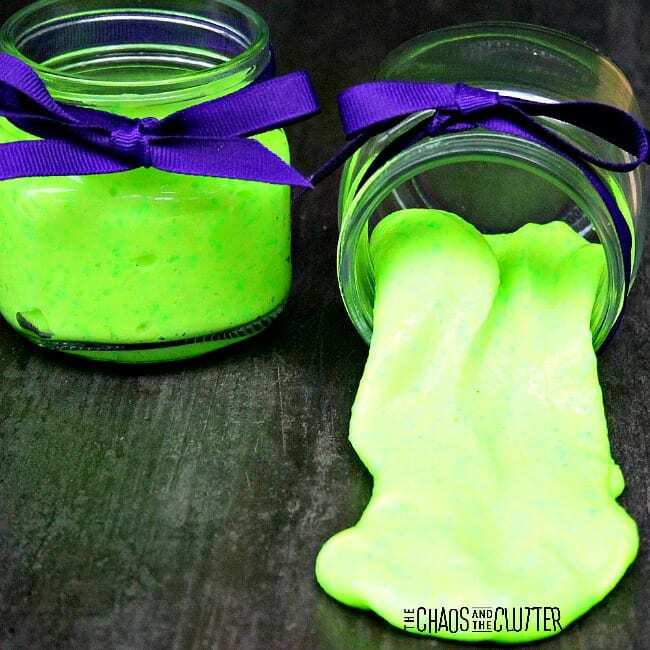 I’m not going to lie… they can get messy! 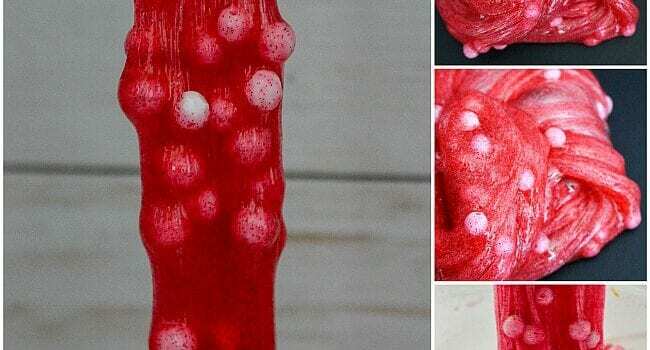 But here are some tips that can help contain the mess and make cleanup easier. 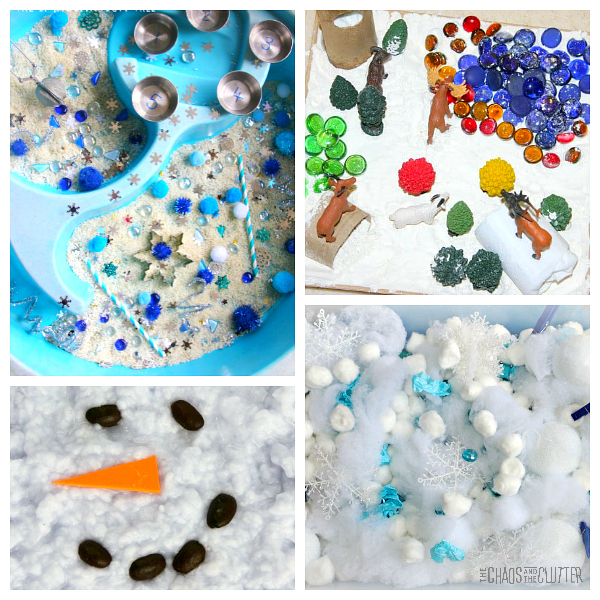 Grab a free sample of our Sensory Play Recipes eBook full of great ideas. 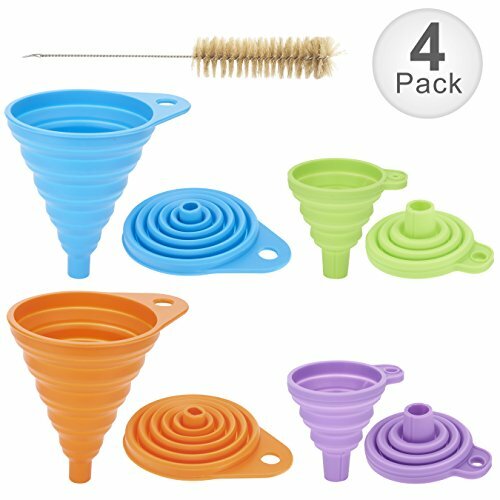 It includes recipes that can be used in sensory bins. Simply input your email below. 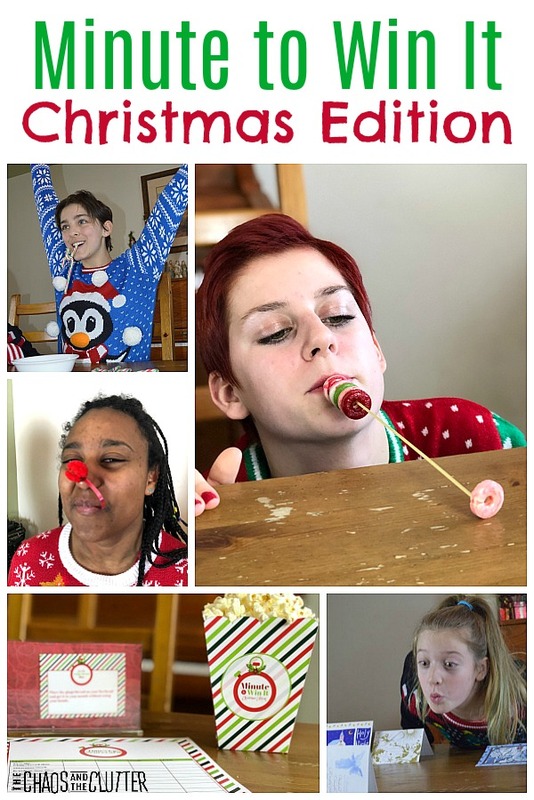 After the success of our original Minute to Win It family fun night and our Dollar Store Minute to Win It, I thought it would be fun to do a Christmas edition. 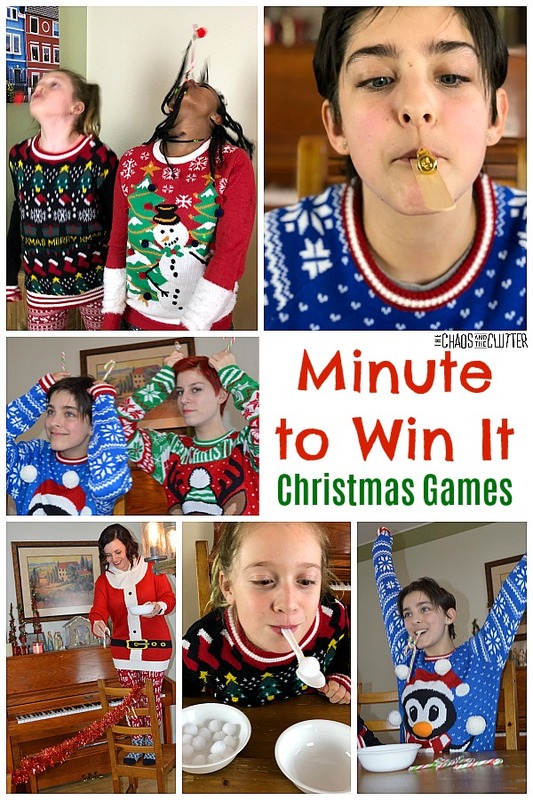 I chose some Minute to Win It Christmas games. It was so much fun! 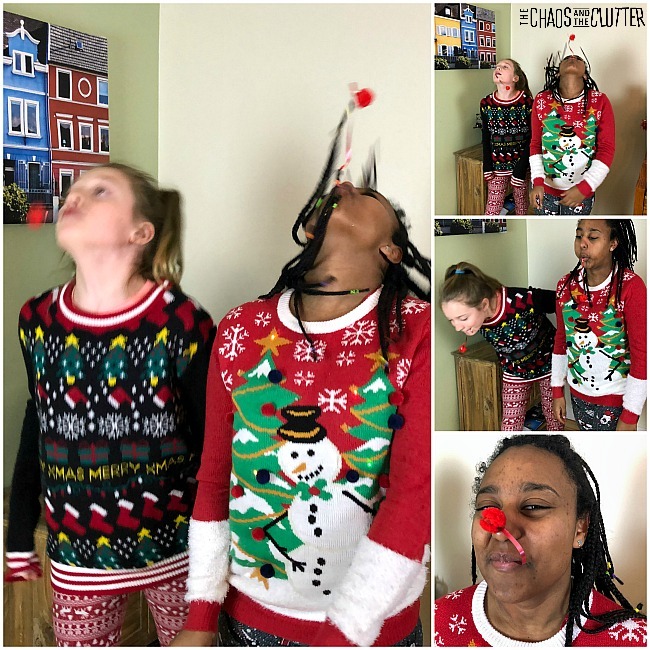 Whether you’re planning a large holiday party or a small family gathering, these games will bring laughter and fun. I’ve purposely chosen games that share some of the same supplies. 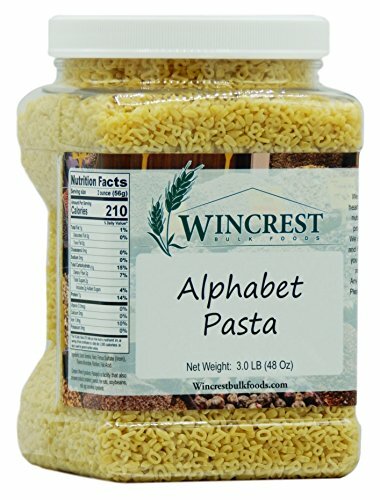 This helps keep it simple to plan and more affordable. 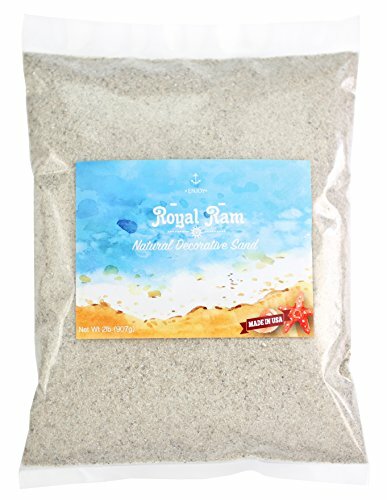 Most of the supplies needed can be purchased at the dollar store. 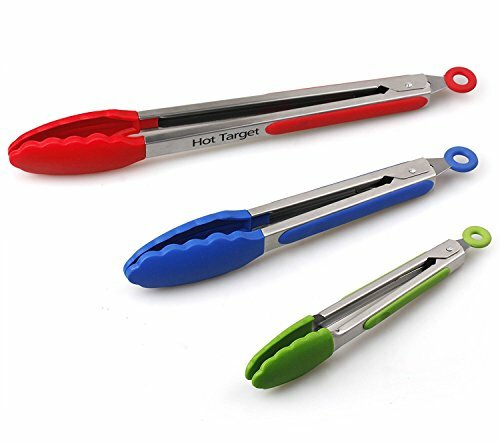 You probably already have many of them in your home. Throw this together at the last minute and still manage to impress. 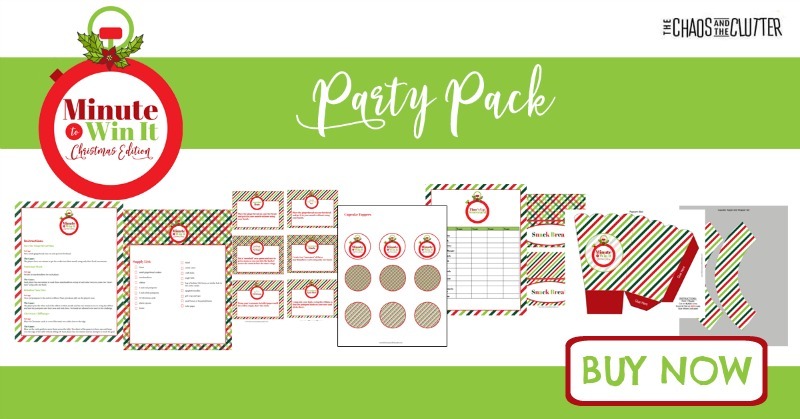 Use our Minute to Win It Christmas Edition printable decoration kit to make things even easier! You can play these games individually or as teams. If you play as teams, be sure to come up with awesome team names to add to the fun! I’ve added videos of most of the games below to give you a better idea of how to play them. My kids and our neighbour had so much fun trying out all the activities. Begin with a gingerbread man on each person’s forehead. 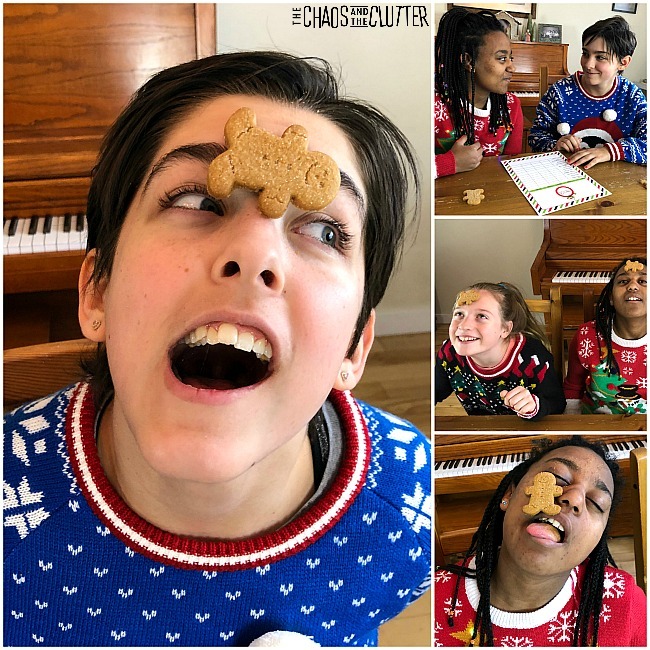 The players have one minute to get the cookie into their mouth using only their facial movements. This is a great game to play in a large group. Everyone can play at the same time or you can play head to head. Each player has one minute to stack three marshmallows on top of each other twice to create two “snowmen” using only one hand. This is an easy game to complete within the time allotted. I included it because it is nice to have a game that younger children can easily play. 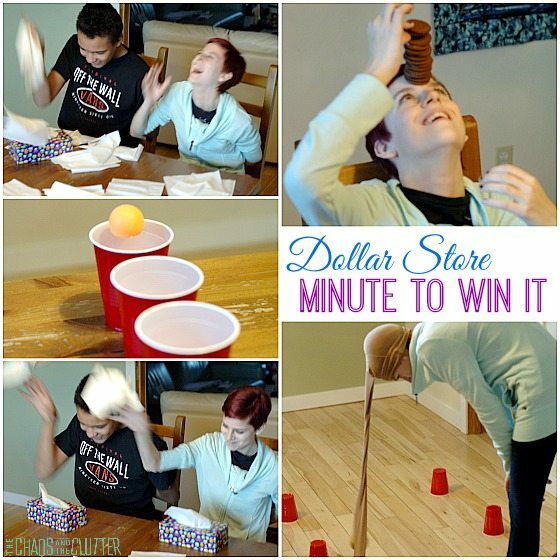 If you’re playing these Minute to Win It Christmas games in teams, choose the youngest players to complete this challenge. Even toddlers should be able to do well at this. 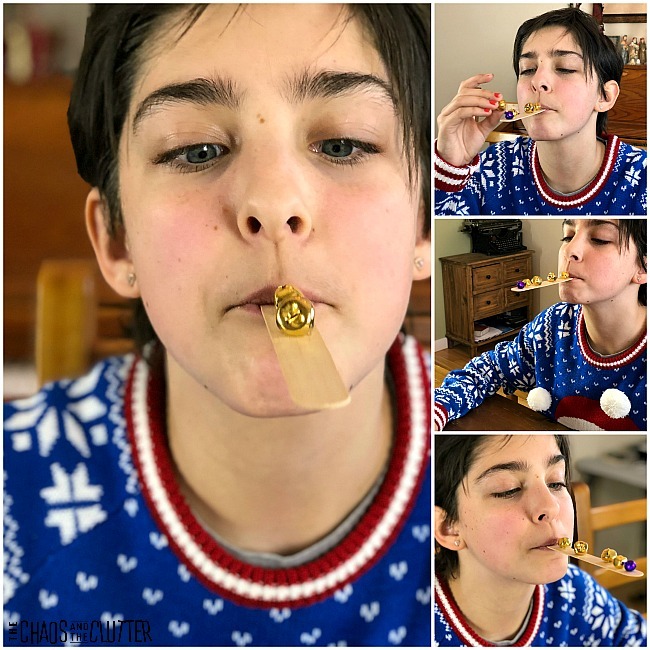 If you are playing with only adults, you may want to skip this challenge or increase the difficulty by requiring players to stack the marshmallows using only their mouths. 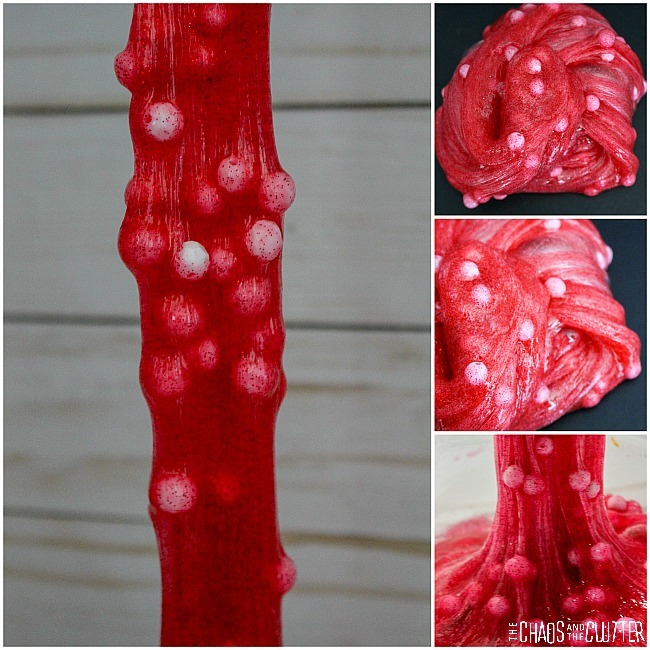 Tie a red pompom onto the end of a ribbon. Make one of these for each player. Place petroleum jelly on each player’s nose. 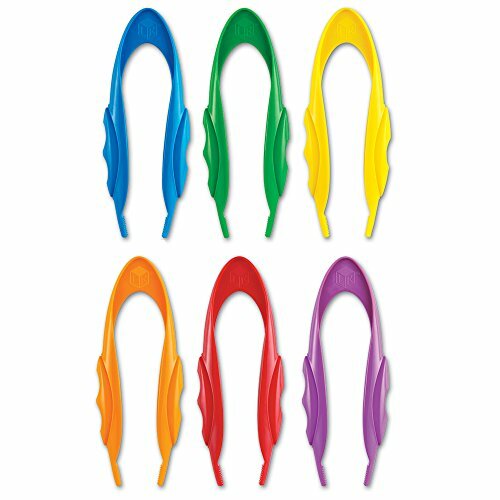 The player starts with the other end of the ribbon in their mouth. They then have one minute to attempt to swing the ribbon and land the pompom onto their nose and stick there. No hands are allowed to be used in this challenge. 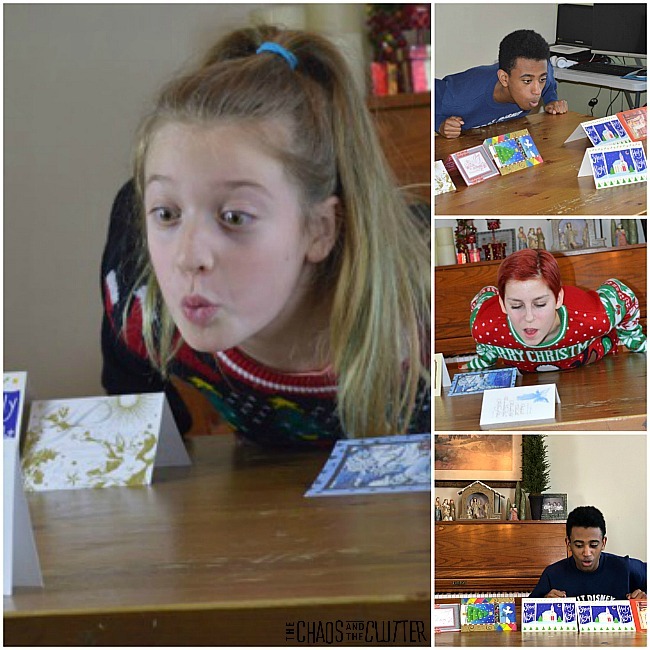 Place 10 Christmas cards in a row on a table close to the edge. 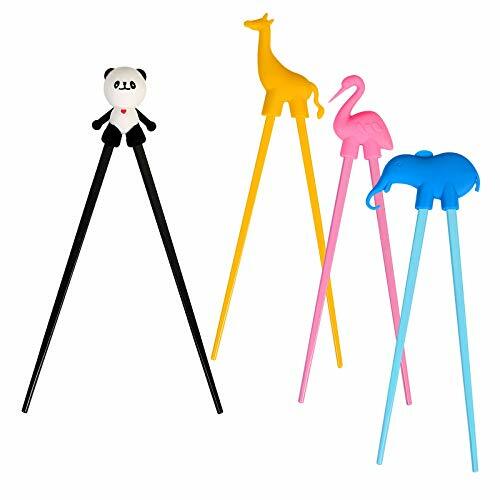 You want to set them up so that they form a tent. Blow the cards gently to move them across the table. The goal is to have one card hang over the edge of the table without falling off. Each player has one minute and ten tries to reach the objective. 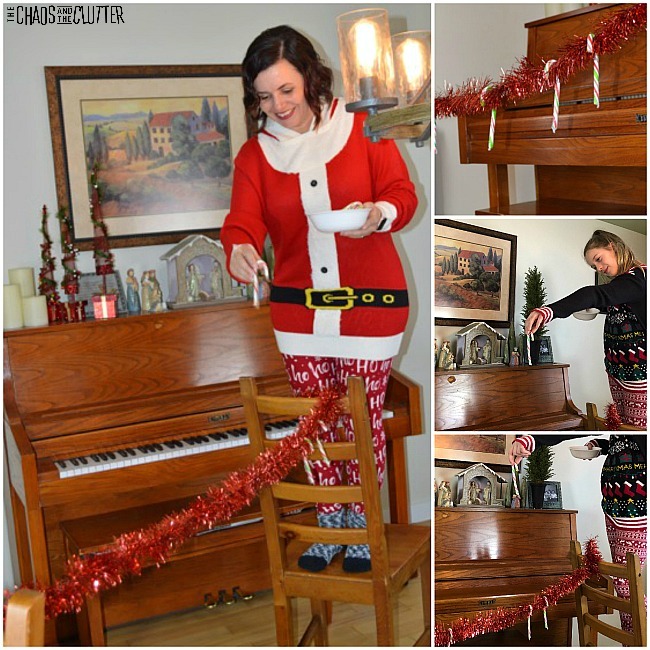 String garland up between two chairs with the seat facing out to create a clothesline-type effect. Give each player a handful (or small bowlful) of candy canes. Have the player stand on the chair and drop candy canes, attempting to have them hang on the garland. You can have another player on the opposite chair playing at the same time. 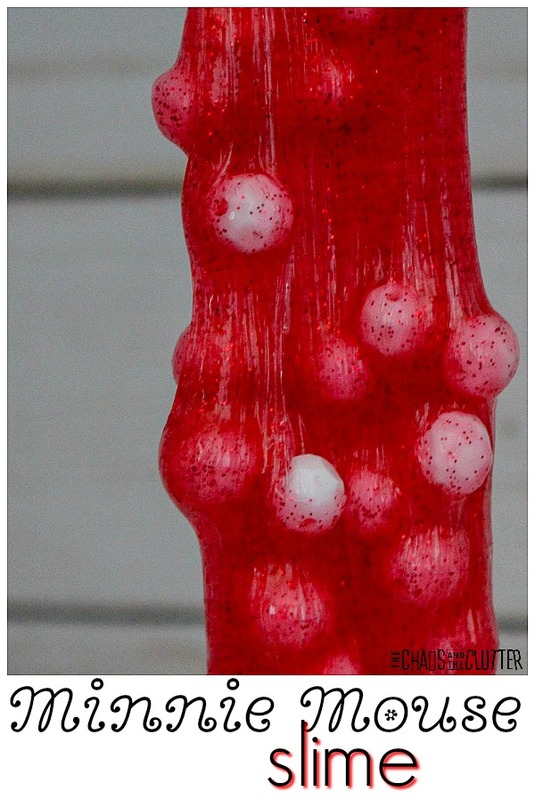 You can either give the point to the person who hangs a candy cane first or see who can hang the most in one minute. 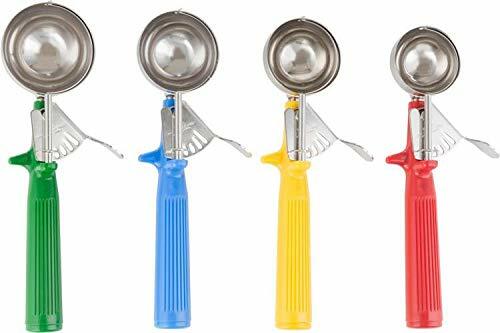 Have each challenger place a craft stick in their mouth and line the jingle bells across the stick in one minute or less. 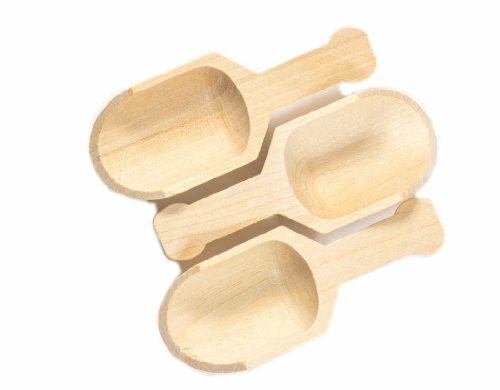 For young children, use the wider craft sticks. 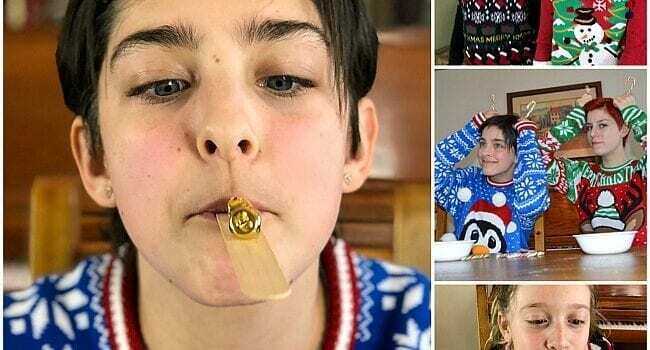 To make it more challenging for adults, use regular sized popsicle sticks. 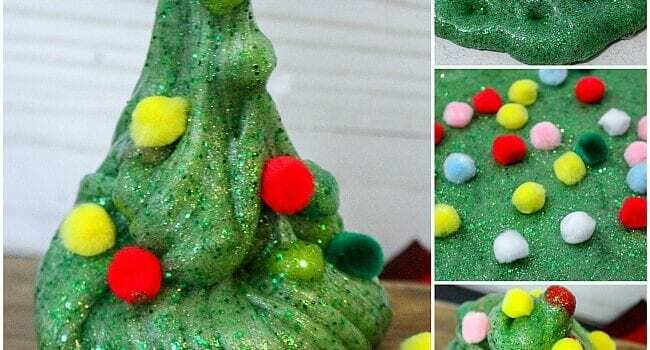 You can also vary the size of the jingle bells to create more difficulty. 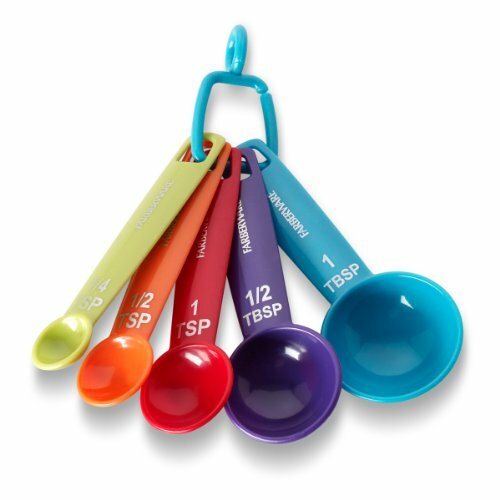 Give each player two bowls, one with fifteen white pompoms and a plastic spoon in it. 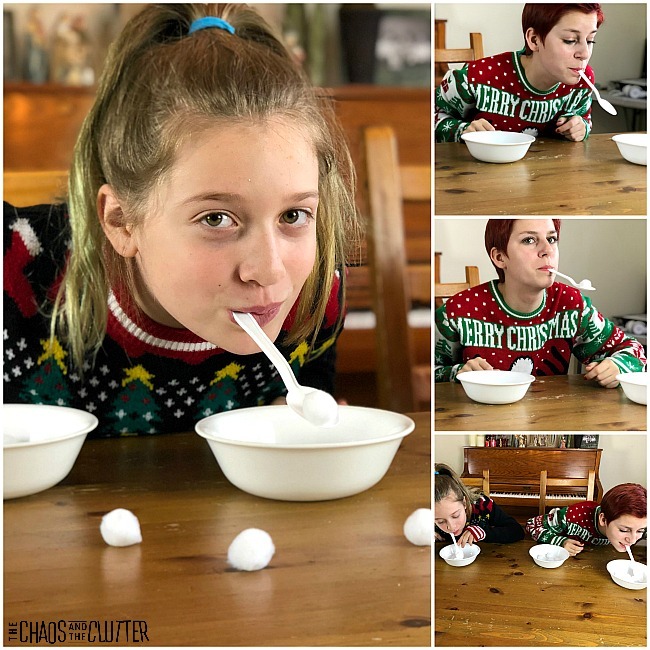 Once the clock starts, the players have one minute to transfer the pompoms (snowballs) into the empty bowl using only their mouth and the plastic spoon. 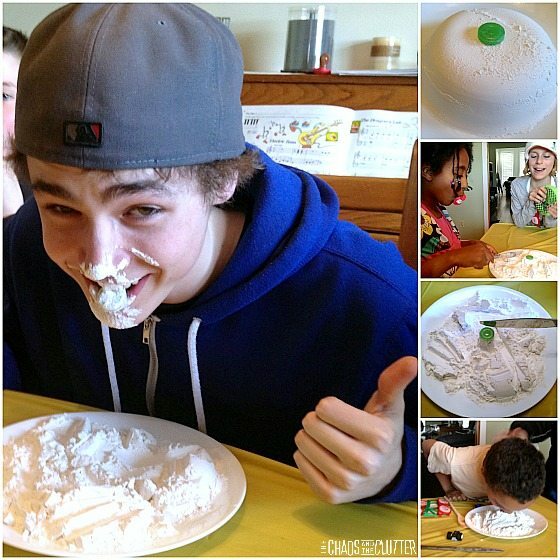 This game is quite challenging, so for younger kids, start with less pompoms or cotton balls in their bowl. 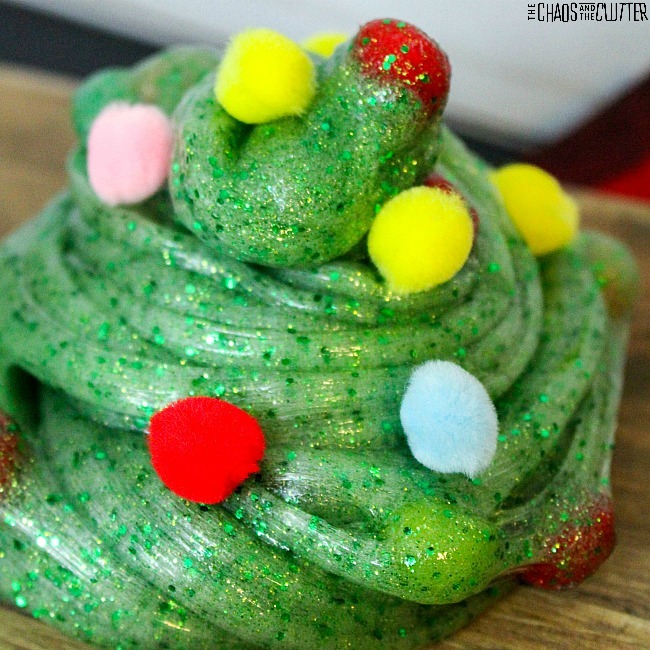 Fill a bowl with wrapped candy canes for each player. 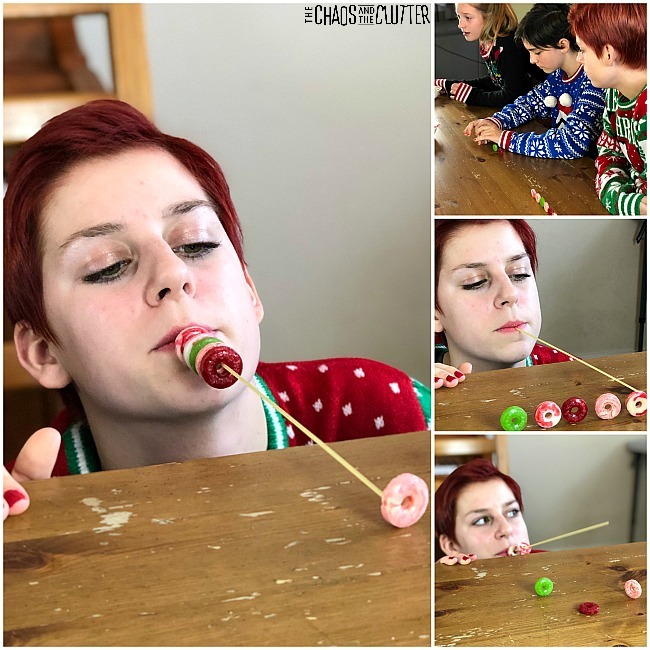 Challengers place one candy cane in their mouth and attempt to hook the candy canes in the bowl and transfer them to the table. 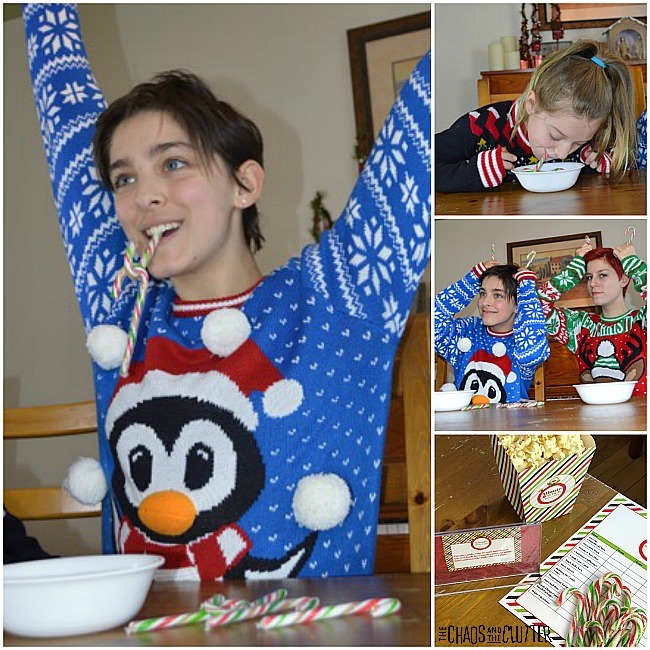 The goal of the game is to move 5 candy canes out of the bowl. The time to beat is one minute. 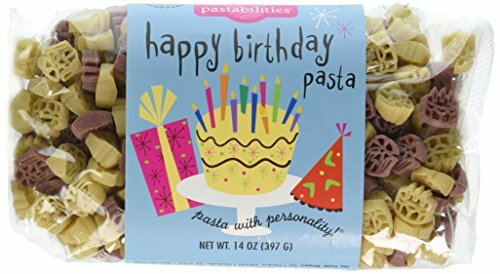 Set out one piece of uncooked spaghetti per person. 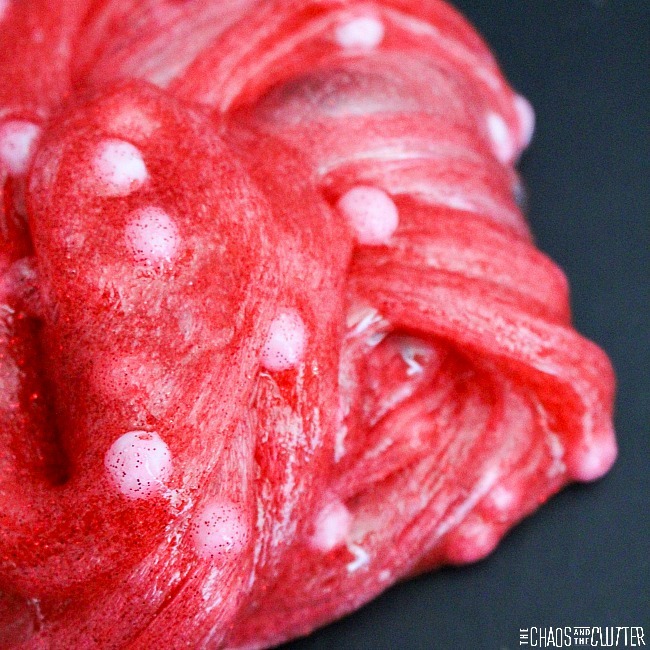 Place six holiday edition Life Savers or similar peppermint candy with a hole in the center on their side so that the hole is facing the contestant. 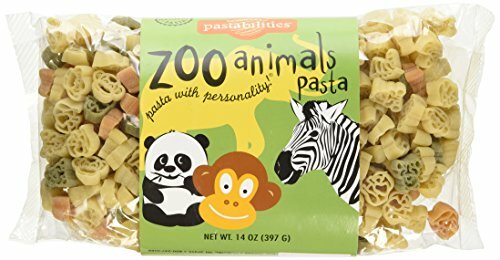 The player must pick up all the candy using only the spaghetti noodle in their mouth. 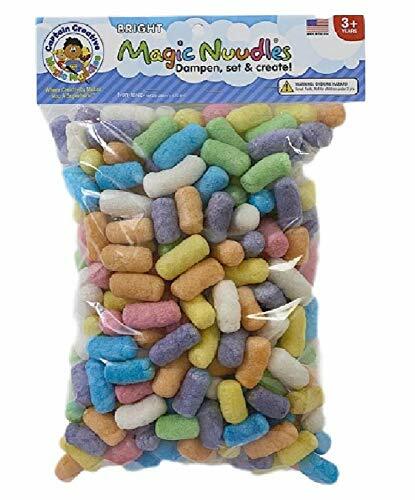 They must stack all six candies onto their noodle in under one minute. Place two buckets or bowls at the far end of the room. 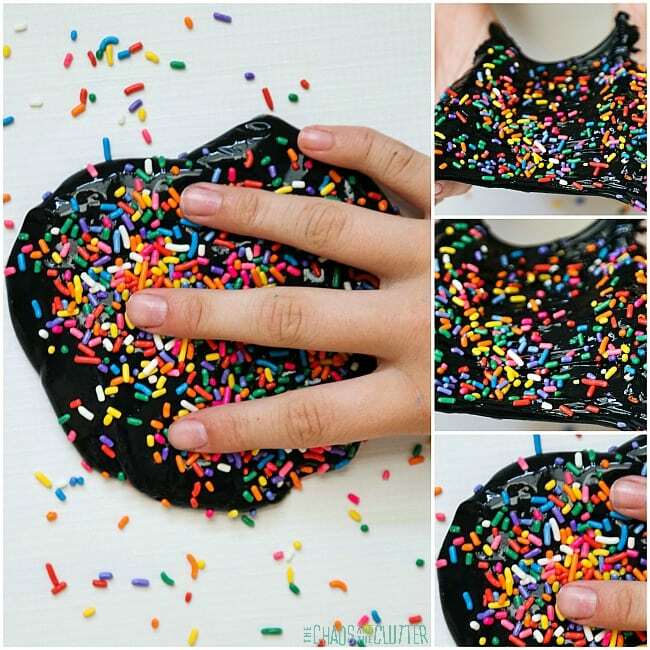 Lay out white pompoms at the other side of the room and give participating players a plastic spoon. This game works with groups as a relay or with two players racing against each other. 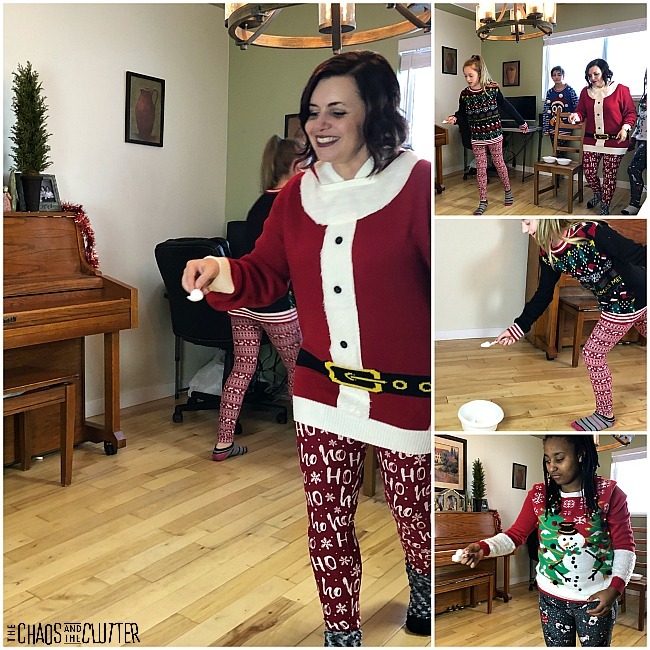 Each of the players places a white pompom (snowball) on a plastic spoon and races to place it in a bucket across the room. The player or team to fill the bucket with the most “snowballs” in one minute wins. Before the event, wrap some small boxes and cans with holiday wrapping paper. Have each player put on a pair of oven mitts. 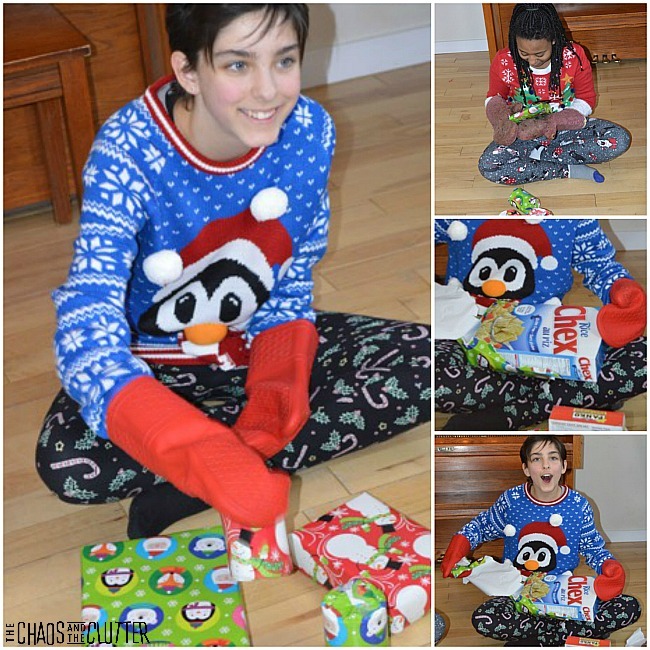 See how many gifts players can open in one minute while wearing oven mitts. This is quite a funny one to watch! As you can see from the video, one of our daughters found the game too difficult and used her mouth to open “gifts”. In case it wasn’t clear in the instructions, using your teeth is not allowed! 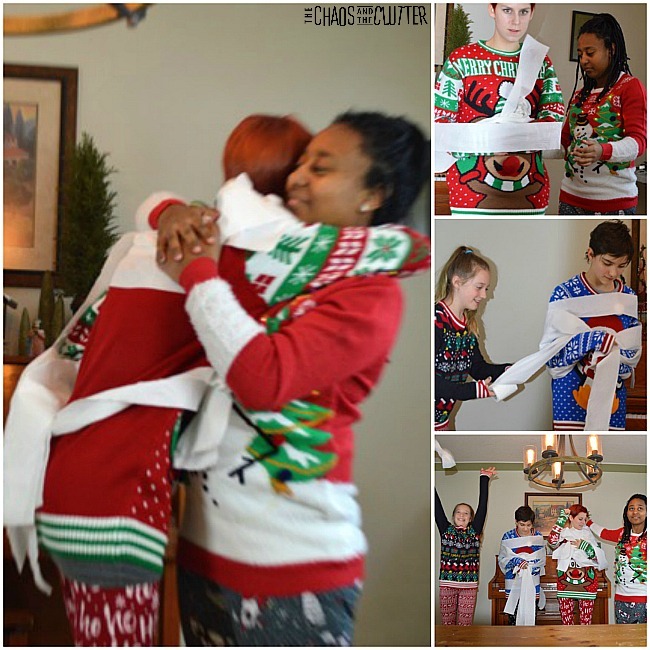 One person stands still while the other wraps them in toilet paper. This game is best player head to head against another two player team. The team that completely uses their toilet paper first wins. It’s fun to see what method the teams come up with to do this quickly. 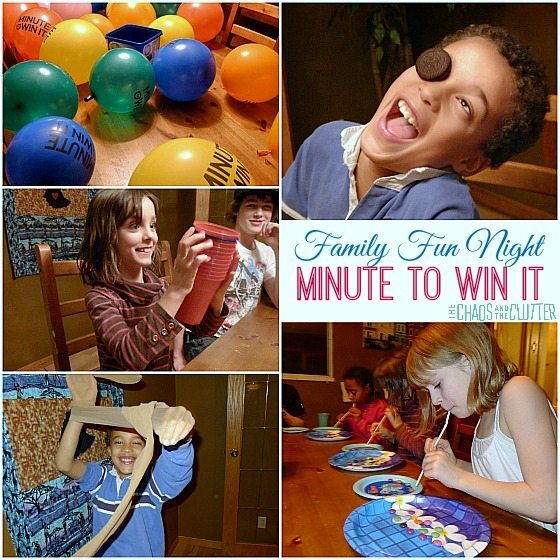 These Minute to Win It Christmas party games are great for office parties, family get togethers, holiday parties with friends, or even winter birthday parties. 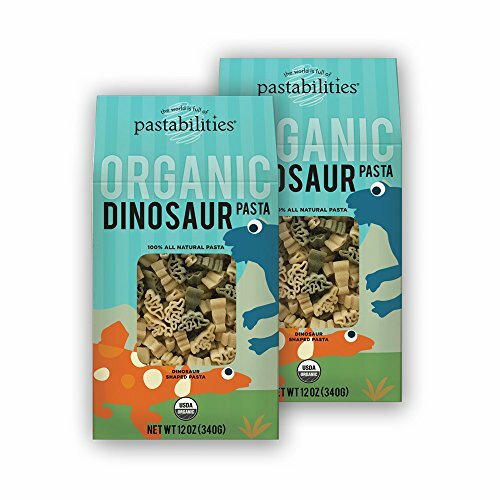 You can easily adapt the games for all ages from preschoolers to grandparents. Set the mood by having Christmas music playing in the background. 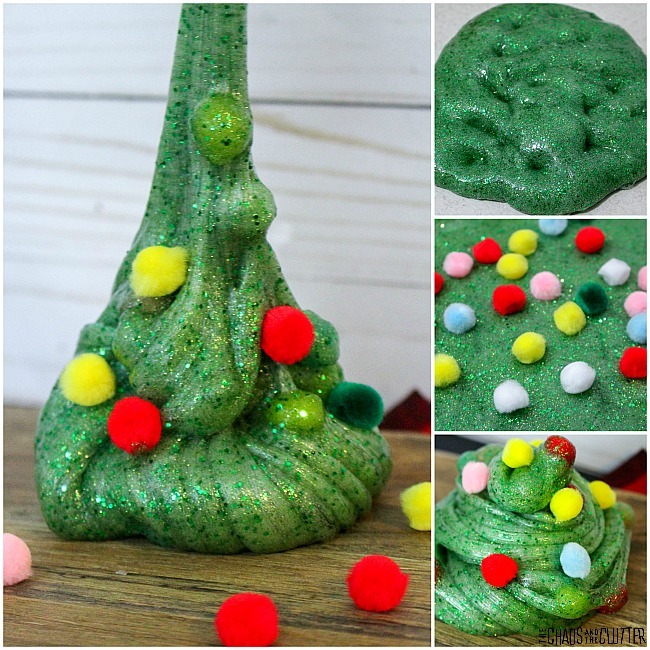 Use holiday decor as your decorations. This means that the lights and tree that are already in the room are all you need!